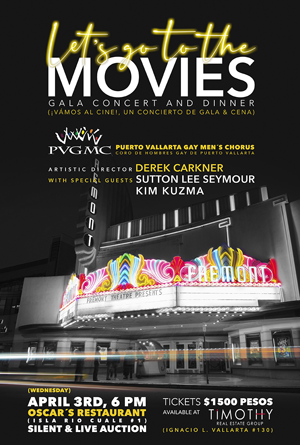 The Puerto Vallarta Gay Men’s Chorus is delighted to announce its 7th annual gala, Let’s Go to the Movies. This event will be held at Oscar’s Restaurant on Wednesday, April 3, 2019. Let’s Go to the Movies is the PVGMC’s seventh annual gala and its major fundraising effort for the year. Sponsorships, ticket sales, and auction proceeds from last year’s event have enabled the chorus to increase its singing membership and perform throughout the year. The evening will begin at 6:00 pm with a cocktail reception including hors d’oeuvres to complement a silent auction. At 7:30 pm, a specially designed three-course dinner will precede a specially produced preview of the chorus’ upcoming spring concert featuring music from the movies. Sutton Lee Seymour and Kim Kuzma will join the chorus for never-before-seen performances of classics movie songs you know and love. Sean Moore of Nacho Daddy will be the auctioneer this year with an exclusive selection of items available live at the gala. Donation tickets are 1500 pesos each and are available in advance at the Timothy Real Estate Group office, located on Calle Ignacio L. Vallarta in Col. Emiliano Zapata. Credit cards and cash accepted. Tickets are also available directly from chorus members. Tables of 8 or 10 are available with addition perks, including VIP preferred seating. Annual sponsorships are available, and feature benefits unique to the gala event, and the chorus continues to build both live and silent auction packages prior to the gala. Interested community members and organizations are invited to contact Don Gipe at info@pvmenschorus.org to brainstorm an idea or submit an auction item donation. The Puerto Vallarta Gay Men’s Chorus is the first organization of its kind in Mexico and all of Latin America, and a proud member of GALA Choruses, a worldwide organization that represents over 8,000 singers and over 170 choruses around the world. Founded in 2012, the PVGMC is a bilingual, cross-cultural chorus with members from Mexico, Canada, and the United States. Under the leadership of Artistic Director Derek Carkner, it has elevated the performance standard and brought renewed audience awareness and appreciation across all of Banderas Bay. For more information, visit PV Men's Chorus.